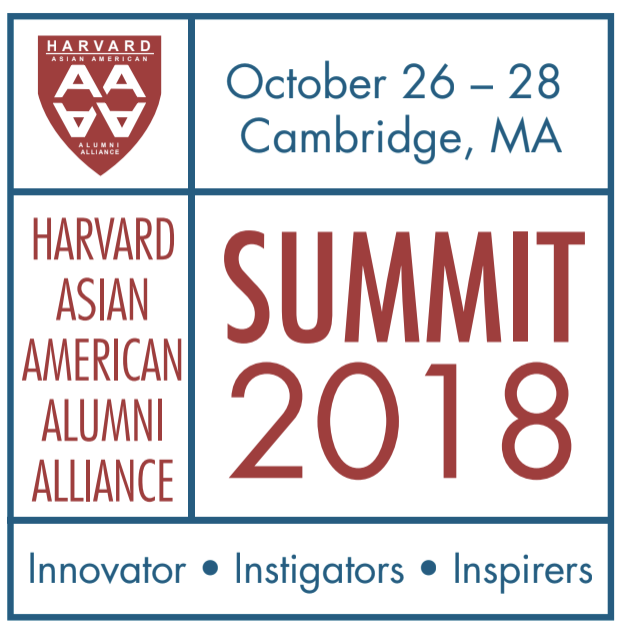 Please join us and hundreds of Harvard alumni back on campus for what promises to be the most exciting Harvard Asian American Alumni Alliance Summit yet. Titled, "Innovators, Instigators and Inspirers," the 2018 Summit, to be held Oct. 26-28, will shine a spotlight on prominent Asian and Asian American alumni from the arts, politics, business, law, science, technology, academia, and media who have made indelible marks in their fields, their communities and society at large. Our first two Summits in 2010 and 2014 drew 500 Harvard alumni, students and faculty from seven decades of classes, every school and multiple continents to the University for a weekend of exploration and connection. Our presenters included Harvard President Drew Faust, World Bank President Jim Kim, "Tiger Mom" Amy Chua, Pulitzer-winning journalist Sheryl WuDunn, Secretary Elaine Chao and novelist Gish Jen. Please join us to hear leaders like these—from many walks of life and areas of achievement—share insights on how they're addressing challenges of the day. You'll meet Harvard Asian alumni who are central to the most provocative issues of our era, from #MeToo to technological disruption to affirmative action. And you'll be able to reconnect with an invaluable network by catching up with old friends and making new ones in an engaging and interactive setting. If you're an Asian/Asian-American alumnus of any year or school, you won't want to miss this quadrennial event! Registration will open this summer. For regular Summit updates, please join our members list at http://haaaa.sigs.harvard.edu/ and visit summit2018.haaaa.net. Please also join our Facebook group. We welcome your input and participation! If you'd like to help, please email summit@haaaa.net.